I was first introduced to Stride Rite shoes when my now 4.5 year old turned 1. Her grandma bought her very first pair. It was important to me that she had a high quality shoe that fit her well when she was taking those first steps. I continue to buy at least one or two pairs of Stride Rite shoes for her each season. She has a wide, hard to fit foot, and Stride Rite is the one place I know I can go to find a shoe that fits her well. I have purchased shoes from Stride Rite in the mall, at one of their outlet stores and online – and I have honestly been thrilled with every purchase. These shoes are made to last – and they come in cute designs that go with a variety of my daughter’s outfits. When it comes to shoes I am all about quality over quantity. 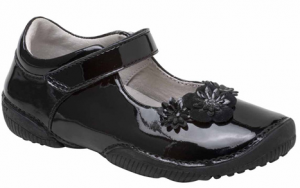 Recently I was given the opportunity to review the SRT Kennedy Preschool Shoe in Patent (seen in the image below). This shoe will go perfectly with my daughter’s holiday outfit, and dresses up some of her jeans and t-shirt outfits. My favorite thing about this shoes is while it looks dressy, it has a nice sturdy sole – almost like that of a tennis shoe. I don’t worry about her slipping in these shoes, and they are sturdy enough for her to wear on the play ground at preschool. Another added bonus is that she can easily get these shoes on and off herself. Stride Rite is currently encouraging moms to visit their Facebook page, and to create your own page in the Stride Rite Moments Book, sharing stories of your kids first steps. Learn more here. Choosing a shoe for your new walker (and as they get bigger) can be a bit challenging at times. My 7 month old will need to be fitted for shoes soon, and I know she is going to be totally different than her older sister. That’s why I am grateful that Stride Rite Children’s Group has launched a new program to make things easier for mom to choose the right shoe for their kids. STEP 1 – Prewalkers: Robeez by stride rite is a pioneer in pre-walkers and offers a wide assortment of soft sole shoes that are designed to flex and bend to help promote healthy foot development. And with the elasticized easy on, stay-on feature, those little feet will always be protected, no matter where adventure leads them. STEP 2 – Cruisers & Early Walkers: From crawling to cruising, SRT Soft Motion is designed for early walkers offering a unique design shaped as the actual foot with rounded edges conforming to the bare foot to build confidence and reduce stumbles and falls. SRT Soft Motion is stride rite’s most flexible technology and is designed to protect and support little feet without restricting movement. STEP 3 – Off & Running: When children are off and running, stride rite’s Sensory Response Technology product is the best choice. SRT Preschool is engineered for active toddlers as their feet continue to go through a critical development stage. The stride rite SRT collection is designed to optimize the biomechanics of the foot to allow children to develop healthy and natural walking patterns. Plus, only SRT Baby and Preschool feature the Check Fit System! Stride Rite is also launching a new commercial tonight – the first to be released in 20 years – that will re-enforce the Stride Rite brand promise. If you are planning to watch the annual Charlie Brown Christmas Special tonight on ABC, be sure to keep an eye out for the new Stride Rite commercial! You can also view it online here. I am thrilled to have the opportunity to give 5 of you a $20 Gift Card to Stride Rite, so that you can pick out an adorable (and functional) pair of shoes for your little one! Please Note: Delivery of this gift card before Christmas is not probable. This giveaway was sponsored by Stride Rite as part of the Win Giveaways 2010 Holiday Giveaway Bash. This post was written by me and was not edited by the sponsor. Read more in my disclosure policy. Find more information on the terms for this giveaway on the Win Giveaways Facebook page. I love the Robeez booties in pink! I went on my own, and I like the Jessica Simpson Shanna. I have never found a shoe at Stride Rite that I don’t love! And a gift card for them would be great! My current favorite Stride Rite shoe is the Toddler Girl’s Boot in Greta! I LOVE the Moose slippers for the bigger boys! Too cute! I LOVE Stridrite because all 3 of my kiddies have “fat feet” hehehe….Thank you for the chance to win this gift card!! alexandrarosewahm@ is a newsletter subscriber. I like the SRT Preschool Alvar. jessica simpson boots are too cute! my 6 1/2 year old daughter wants some Fancy “High Boots” as she calls the,. She like the dressy Black Boots, so i am getting her some with the GC! :-) thanks for the chance to win! I have 3 kids but only one girl! I always love buying the mary janes for her! My favorite is the Calista (Toddler), they are soooo cute! It is too difficult to decide. My 3yo daughter LOVES shoes and is always on the lookout for a new pair! Advertising on facebook! I like both you and Stride Rite too! Like the Darth Vadar shoe for boys. DD would love the stella boots! I love the Star wars General Grievous & Last Airbender shoes for my oldest son. I like the “soft motion shay” shoes for my 13 month old. My granddaughter would love to have the glitzy pets starr sneakers. I would choose the Robeez 1st Stepz Organic Button-up Bootie, since its both organic and my daughters feet will be properly protected! I retweeted this on twitter! I subscribed to this feed!! My favorite is the NMS Keegan hook and loop! I love all the Stride Rite shoes. I well remember my daughter getting her first pair of pre-walkers over 35 years ago. My mother-in-law stressed the importance of a well fitted shoe and I’ve carried that wisdom over and passed it to my children. My grand-children make several trips each year with me to our local Stride Rite for a good fit and quality shoes. Many more options and styles to choose from these days, but my favorites for babies and toddlers is still the classic “Elliot”. Nothing says well cared for better than a good looking clean white pair of Stride Rites on a child’s feet. I like the SRT Preschool Kennedy! I think the Glitzy Pets are cute, my girls would love them. The Glitzy Pets tennis shoes are really cute. I like the girls Shiloh boot. Very cute. My favorite shoe is the Sperry topsider. Any color, they are classic and timeless. I love the keds tennis shoes that look like saddle shoes perfect for a school uniform and still can play in them! Well, my little one had wide feet so we need to get them the Wide tennis shoes. just subscribe thanks to Heather’s link at passion for Savings. Robeez by stride rite Navy Bootie for girls is my favorite at the moment…looks great for winter. I like the preschool Ashton. We are currently in the market for some new shoes. Would love a gift card. I LOVE the Frost boots for snowy weather – warm and cozy! I love the robeez 3d flower! my 1 year old has 3 pairs of robeez I love them they are the best for prewalkers! Promoted the giveaway – thanks! I would like to get my son the star wars light up sneakers. Preschool ton would be perfect for my son. My little boy loves star wars, so we’d have to get them. My son is also a wide hard to fit foot! I’ve been buying him Stride Rite since he started walking. He’s now 5 1/2 years old and Stride Rite is the only place we buy his shoes. He LOVES the Superball shoes! I think the Sperry Top-Sider Tevin are nice. Wish “Stride Rite” brand carried more dressy boys’ shoes. I love the Robeez booties! I love the Robeez booties for boys!! I love the Frost boots! Robeez booties but for boys! I like SRT soft motion Rico for boys. I like the SRT Preschool Kennedy. my favorite shoes are the robeez collection – they are perfect for my baby who is about to start walking! Fave shoe is Brooklyn – perfect little girl shoe for the holidays! My son loves his Captain Rex stride rite shoes and wants another Star Wars pair. It’s getting really cold here so the Shiloh would be perfect! I like the Preschool Ashton for boys. Stride Rites are the only shoes I’ve found that fit my 1 year old. I would love to get her some of the SRT Noelle shoes! I love the saucony gym shoes. — my kids would get to choose the color. I like the little SRT Soft Motion Myra for my daughter. What a great giveaway – THANKS! Honestly, I love every Stride Ride shoe. I have two kids that have only worn Stride Rites (or Robeez) and they are the best shoes. They may wear hand me down clothes, but their feet are always stylish and in the best shoes money can buy! My daughter would like to try the SlingShot! I would love to get my son the SRT Landon shoes. Tommy Hilfiger Mitch for boys! I like the toddler boots the greta.. I tweeted this as well. thank you! I don’t think I can choose just one, I’ve always loved Stride Rite shoes for my kids! I love the Mary Jane style shoes! My favorite shoe is the SRT Preschool Drea. My little guy can only wear Stride Rite shoes- so they are all my favorites- well all the boys stuff. He has XXW feet which can make for $$$$ bill for shoes. I like the SRT Preschool Ashton shoes. The finn boots are sooo cute!! love them! I love the “Dupree”…and I shared on fb! The Gretta boots are adorable. I subscribe to your blog via gmail. I think we are almost ready for stage 2, so the SRT Soft Motion Scarlett look great. My favorite on the site is the SRT Throttle and the World of Eric Carle – Catapillar (although my son has outgrown this style). Love the Captain Rex lighted shoes! I love Stride Rite shoes as they are the only shoes wide enough to fit my toddler boy! I would go with the Star Wars shoes; I think my son would love them. I love their girls boots. I like the Shiloh style boots! Cute! I love Stride Rites for my girls and a gift card would be great. Right now I love the Robeez for my 6 month old. My 4 year old owns stride rites in practically every color because her feet are so narrow, I can’t find shoes that fit her anywhere else. Our favorite is the Sperry Top-Sider Oakam slip-on; we’ve had it in every size ! My favorite shoe is Soft Motion shoes for early walkers. We are big Robeez lovers in this house. Since I am due with #4 in February, I would use this to buy him a new pair. Thanks so much for this giveaway! Have a blessed Holiday season, M.
Devout FB follower! Thanks, M.
I love Robeez shoes, they come in so many cute designs and are so comfy! My son would love the Stride Rite Slingshots. My favorite is the Pre-walker soft sole shoes. Thanks! I’m a RSS feed subscriber. I am a subscriber. Please enter me to win the Stride Rite Gift Card giveaway. Thanks! I love the Keds Graham Leather Hook And Loop for my little 17 month old son. He would be really cute in them and they go with tons of outfits. Please enter me to win the Stride Rite Gift Card giveaway. Thanks! Honestly, I love all the Stride Rite shoes. My kids also have very wide and thick feet, which are extremely hard to fit. Stride Rite always has something that I know will fit them. I’m headed there this weekend to buy my daughter some in fact. Hope I win……it would come in handy. I love the SRT Soft Motion Cygnet and all the other Soft Motion shoes. That is all my son has ever worn and they are wonderful. I love the Gavin style for my son. I believe the nephew would love the Thrasher. Any SRT is a great shoe for my son. I follow you on facebook and also get your EMails I really like the Star Wars Lighted Captian Rex for my grandson He is in great need of shoes and loves the ones that light up!! I LOVE the Robeez Mini Shoez Cowgirl Boot! The Nickelodean Slimers are rockin’! I like the slingshot lace boys shoes. Robeez are great! I love putting them on my kids!! We love the Robeez booties in brown and in pink, so easy to put on and get off! The “Sperry Top-Sider Cutter” is too cute for a little man! I receive your blog updates via email! The baby boots are adorable! I like the Star Wars light up sneakers for boys. Star Wars Lighted General Grievous would be a huge hit! I love the baby girl Robeez Soft Soles Booties! I love the Alysia shoe! My favorite are the Glitzy Pets by stride rite – Toddler Sookie! I love the Eric Carle inspired butterfly shoes! love the star wars shoes for my son! I love the girls boots! The light up star wars ones. My favorite Stride Rite shoe is the Star Wars Lighted Captain Rex! I promoted this on facebook!! The step 1 Robeez would be great for my son! I like the Girls’ sparrow. I like the boy’s preschool Brody shoe. My grandson would love the Star Wars light up shoes! I like the preschool ashton shoe for boys! My favorite shoes by Stride Rite are the Robeez for my little walker! I love the Soft Motion Scarlett. I like the boys Rapid A/C. My favorite is the SRT Alvar shoe. I love Robeez! they are awesome for little ones! I like the Glitzy Pets by stride rite – Sookie for my little sister! My 11-month old girl has just started taking a few steps. We will be getting her some stride rites soon. I like the: SRT Soft Motion Myra. I like the pre-walker. My daughter is 14 months old and we bought these for her when she started taking a few steps on her own and she seems to enjoy having them on and giving her a little extra “help” and support. The Last Airbender shoes are really cute! My son would like them. I love the First Mate sandals. They are asy on, easy off, plus they protect the toes of active toddlers. I really like their pre-walkers. I really like the SRT Soft Motion Myra shoes. I subscribe in my RSS Reader! My daughter loves her sunshine boots…and she looks great in them too! I like the SRT Brody. i LOVE the emu girls brown boots! I just subscribed to your emails!! I like the SRT Preschool Brody shoe. I also subscribe to your daily e-mail feed. My favorite Stride Rite shoes are the 3d Monster booties. Love the Tommy Hilfiger Mitch shoes. I love all the little mary janes. One of my girls would love to get the Jessica Simpson AManda boot. My favorite shoe is Keds Shimmer MJ. I subscrbe to your emails. I like the Edmontosaurus for my son. Thanks! My daughter would love the boots. She is completely obsessed with boots and she isn’t even 2 yet. I posted on FB and follow you. Love the robeez shoes for infants! I like the Mary Jane shoes. I like the Glitzy Pets Starr shoe. Just bought them for my 4 you son! He loves them. the glitzy pet its so colorful and cheeky adore it! Several of my girls have worn the Lollipop sandals. I like them a lot. I don’t think there is a Stride Rite shoe that I didn’t like!! Terrific!! I subscribe via email – Merry Christmas! The keds shimmer mj are really cute! I’d have to be practical and get some sneakers for my daughter. I love their Anita style. I like the Toddler Keds. Thanks for the entry! I like the Robeez booties! I love the Jessica Simpson Kiara Boots! Adorable! My son would love the Star Wars tennis shoes. The girls Glitzie Sookie casual shoe is my favorite!! Right now I’ve got my eye on the SRT Soft Motion Rico for boys! Soooo cute and perfect for my new little walker! Oh my goodness! I would for sure be getting my son some of the star wars light up shoes! They are so neat!!!!! the glitzy pets shoes for girls are cute. I like the Slingshots for girls. My favorite is the Saucony brand that they sell at Stride Rite! My little man would ROCK the srt foal shoes. Super cute! I love the ones called Kennedy! I like the SRT soft motion Myra ! My daughter needs new shoes. I like the Sperry Top Sliders Mary Jane! I follow you and Stride Rite on FB and told my FB friends about this round of giveaways! It’d have to be anything with Disney for my little princess. My son could really use some new dress shoes and the Tommy Hilfiger Alistar would be perfect! I love the SRT Preschool Kennedy shoes! Ooh – Glitzy Pets shoes – bet that’ll start a fight between my daughters! I like the Alysia for toddler girls. these would be great for my infant. I love the walking shoes. I’d love to get my daughter the “Shiloh” shoe! The stella boots are cute! I like the Dynamic shoes for boys. i love the mary janes – so classic!